With the production of Brigadoon early in 1957 (the year before we arrived at OHS), under the leadership of popular musical director, Allan Segal (who had just arrived at OHS after a brief career as a Broadway musician), our school established a tradition of outstanding annual productions of wonderful Broadway musicals every spring (Click here for a complete history of over 50 years of OHS spring musicals from 1957 through 2009.) and other dramatic and comedic plays presented by each graduating class as its "Senior Play," all in our own very fine ("fee-fee, fi-fi, fo-fo, fum") audi – tori – um. The spring musicals were produced for presentation to the community through the joint efforts of our drama and music departments. 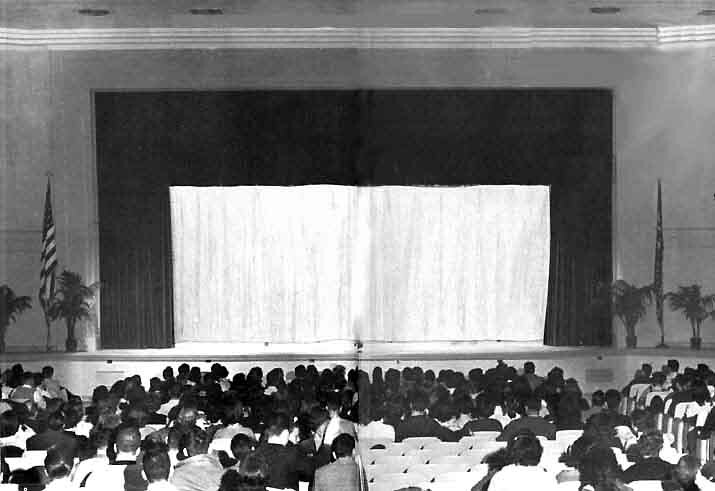 Despite the fact that Broadway was only 25 miles away, the people of our little town loved to attend these musicals and the senior plays put on by the students. Of course, we didn't charge Broadway prices. For example, during our three years, tickets for any of our musical productions were 75¢ for students and $1.25 for others! And invariably, many of us who participated in our school musicals and senior plays, whether as performers or behind the scenes, consider these experiences among their fondest high school memories, and among the most important educational influences in their social development.